A device and method for testing spacesuits. As far as I know, this is the earliest reference to a method of testing spacesuits, which seems like a very useful idea. The expensive round figure in the chamber was walking back-and-forth, swinging his arms up and down, jumping in the air, shadowboxing a little, and removing all doubt about it being in full possession of its powers. Korf opened a little valve. The air rushing into the chamber, the bell sound it again, and the fantastic figure resume to its normal appearance. "I congratulate you!" said Suchinow when he had removed the suit. 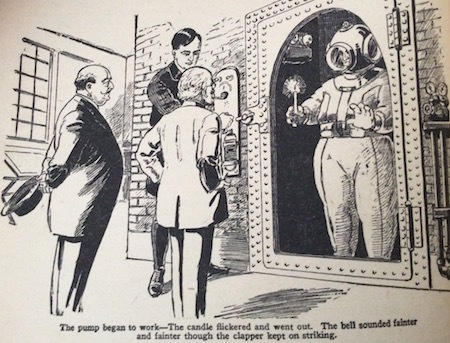 "It is very probably possible to remain in airless space in this pneumatic suit."